Let’s Be Honest; Is Your Digital Performance Up to Par? The omnichannel digital world has infiltrated nearly every aspect of consumers’ lives. From shopping to financial planning to home automation – everything is driven by apps and performance expectations are grow higher every day. Who has 106 years to troubleshoot 138,602 outages?? April 30 is National Honesty Day. It is time to get honest about digital performance and address the root-causes of these issues head-on. End-users are connected 24x7 by desktop, laptop, smartphone or tablet everywhere they go. We live in an omnichannel, continuously connected world where you’re not going to hide for long if you’re an application developer, tester or production team that hasn’t honestly faced the fact that performance demands are rising. We all need to get honest about digital performance and take the steps to address performance shortfalls. To do this successfully, digital leaders need a solid application performance management (APM) strategy. APM ensures that companies’ business-critical applications are running strong from the moment they are rolled-out to end-users. For the enterprise, more operations depend on consistently flawless performance than ever before. Customer facing apps, conversions, brand equity and brand loyalty depend on digital performance. This is what will really show your customers that you’re serious about honesty – following through with high-performing apps and sites that reflect the aspirations of your brand. So what are the questions you need to ask yourself on National Honesty Day 2015? 1) Is your focus on digital performance? If you don’t have a strong application performance management (APM) strategy, you aren’t going to get very far earning trust from your end-users. You just won’t be able to meet their expectations. When digital performance isn’t sufficiently mapped-out, you end up facing issues you didn’t anticipate. This can impact your credibility and your bottom line. If you focus on performance, you won’t have to worry about whether or not your end-users will decide to do business with you again. Applications need to be ‘load tested’ ahead of time to make sure they can withstand high traffic and heavy use, or users will be unhappy when their experiences are not up to par. Harris Interactive shopping research confirms it takes just seconds for consumers to give up on a site and head somewhere else with dollars, loyalty and opinions to share on social media. So, don’t let your competition surprise you – be honest with yourself and your business now, roll up your sleeves -- and focus on digital performance. 2) Do you keep any eye on (and understand) your end-users? If your genuine intention is digital performance, you need an APM solution that provides visibility from each and every end-user’s perspective, 24x7. There is no escaping the truth with this level of visibility. It is just what you need to succeed. To manage digital performance, as complexity grows and the number of platforms your customer interacts with you on are more varied, you must have comprehensive insight into all transactions at all times. Sampling isn’t the best approach – it’s like ignoring some of the truth, some of the time and looking at the real experiences your users are having just once in a while. 3) Are you muddying performance with too much complexity? To operate as a high-performance team, you need an APM approach that shares a single perspective with all stakeholders, from development to testing and QA to production. To simplify digital performance, get a unified, honest perspective on where challenges really stem from. Let's look at a major e-retailer that optimized its site for minimal trips to download content. Their performance was over 50 percent better than competitors who packed in lots of fancy features. Keep things simple – rather than include every option under the sun and then let users down with a sluggish experience. It’s easier to be honest that way, and better for your end-users too! 4) Are you missing the boat on mobility? Mobile shopping has become ubiquitous. If you’re thinking of it as a new trend, you are missing the boat. Projections from Forrester Research reveal that by 2017 holiday mobile spending will reach $370 billion . Mobile shoppers demand better performance every year as they become more reliant on mobile data to make decisions and transactions from wherever they are -- even while in store aisles. In the Harris survey, 37 percent of smartphone and tablet users said they would shop elsewhere if a company’s mobile site fails to load within three seconds. The truth is, companies need to be sure the end-user experience they deliver on tablets and smartphones meets or exceeds the digital performance users have come to expect from traditional PC browsers. 5) Are you ignoring performance blind spots? Let’s be honest! A complete application lifecycle approach is essential for eliminating blind spots that ruin performance. You need synthetic load testing and monitoring, with real-time, 24x7 tracing of real-user activity and performance to honestly and fully understand how changing activity and unanticipated pressures are experienced by every end-user. 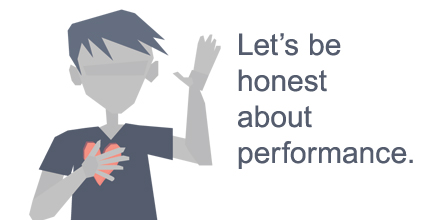 The Bottom Line: Getting honest about digital performance will put you confidently in the lead. When you reflect on what’s essential to the bottom line, you’ll find honesty at the heart of it. You might have great offers on your sites and apps, but if users aren’t feeling that you’ve delivered on your promises with a great digital experience, you will lose revenue. Seconds matter and performance is crucial for winning and retaining customers, loyalty and revenue. If you don’t have one, put an APM solution in place now to be sure you’ve got what it takes to answer these tough questions not just on National Honesty Day, but every day of the year.